1 of 1 Heat oven to 350 degrees F. Coat an 8-inch baking pan with nonstick cooking spray. 1 of 1 In a medium-size bowl, stir together flour, sugars, pumpkin pie spice and salt. With pastry cutter, cut butter into the mixture. Stir in walnuts. Refrigerate. 1 of 6 In a large bowl, whisk together the flour, baking powder, baking soda, pumpkin pie spice and salt. Set aside. 2 of 6 In another large bowl, beat butter and sugars on medium speed until creamy and blended, about 3 minutes. Beat in eggs, one at a time. Add vanilla and beat until smooth. 3 of 6 On low speed, beat in the flour mixture in three additions, alternating with buttermilk. Beat for 2 minutes. 4 of 6 Spoon half of the batter into the prepared pan. Sprinkle half of the topping over the batter. Spoon remaining batter over topping. Sprinkle remaining topping over top of cake. 5 of 6 Bake at 350 degree F for 50 to 60 minutes or until toothpick inserted in center of cake comes out clean. Cool completely on wire rack. Loosen edges with a knife or small spatula. Cut into 12 equal pieces. 6 of 6 In a small bowl, mix together confectioners sugar and just enough milk to get a good drizzling consistency. 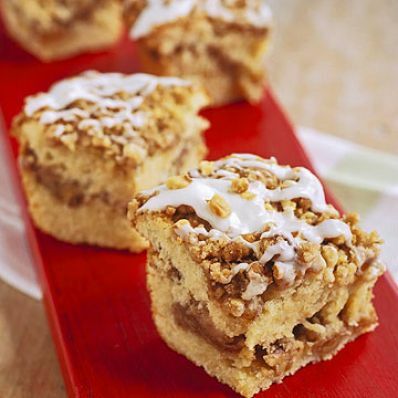 Drizzle over cake squares and allow to set before serving. Makes 12 servings.